When I first visited Bergen, Norway many years ago, I arrived in my camper after driving across the mountains from Oslo. I found then that if you’re in Scandinavia, Bergen, Norway is well worth a visit. This time, however, I took the quicker and more comfortable route, flying into Bergen airport from Stockholm. Located in nearby Flesland, Bergen airport is only 20-30 minutes by taxi ($28-35) or bus ($5-7) from Bergen. The buses are immediately outside the entrance to the terminal. I also stayed in a hotel, not a campground, which was close to the city’s famous harbor. The hotel was the Augustine, which was near the harbor and quite comfortable. And on this trip I dined in more restaurants in Bergen than I did on my maiden trip. 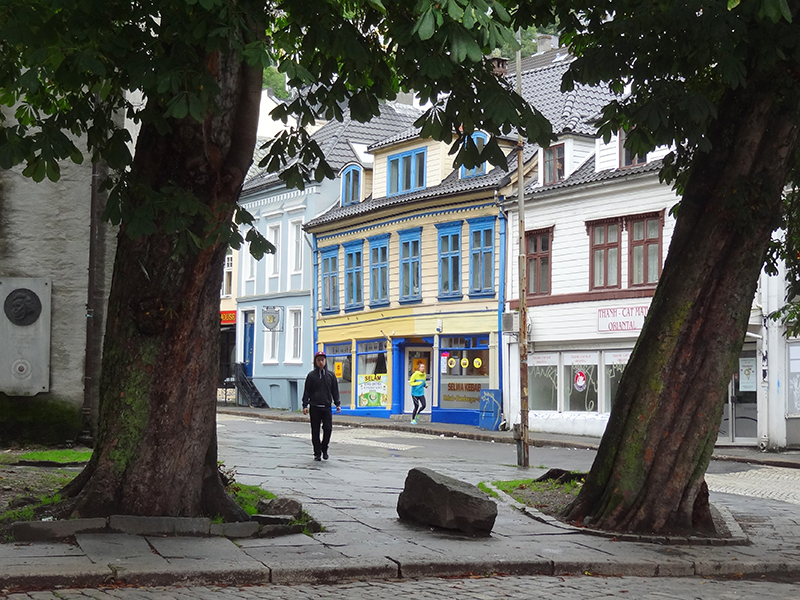 Still, I found the most famous area of Bergen remains its harbor since it played such an essential role in the history of the city beginning back in the 13th century. It was then when the city-states of Germany formed trading leagues, the most significant of which was the Hanseatic League. 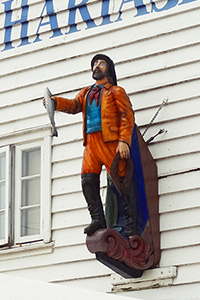 The Hanseatic became one of the most powerful economic forces in Northern Europe, and many of its traders were drawn to “Bryggen” (present-day Bergen, Norway) due to its sheltered harbor. 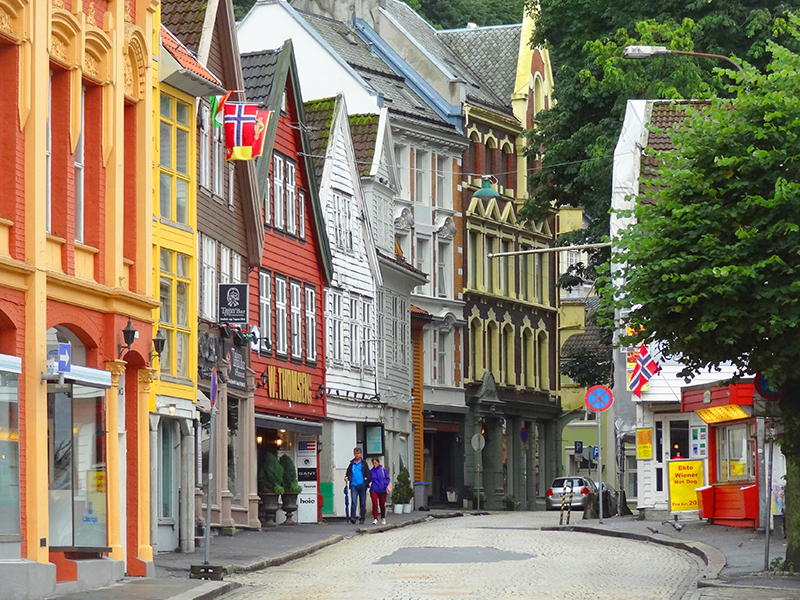 It’s those iconic Hanseatic buildings that still draw travelers to Bergen today. If you’re looking for things to do in Bergen, Norway, head first to the Hanseatic Wharf, the most colorful and historic part of the city. The Hanseatic League built – and rebuilt, time and again after devastating fires – the colorful gabled buildings that stand along the wharf. Emblematic of the city, they lean so precipitously they look as if they’re about to fall over. Still connected by wood-plank alleyways, they once housed the offices and living quarters of the men who worked here. Today they’re listed as a UNESCO World Heritage Site and are home to dozens of shops, galleries, and restaurants. Also visit the adjacent Hanseatic Museum, a fascinating little museum – and eye-opening to me – that provides insights into a period of history few of us know anything about. There were only a few people in it, but everyone seemed interested in everything they were seeing. With my guide, I continue walking along the harbor to the Bergenhus Fortress, inside of which are the old Royal Residence and banquet hall built in the 13th century when Bergen was the capital of Norway. The fortress was built to protect the harbor and was used as recently as World War II. Nearby there’s an old German bunker wholly covered with ivy, with several others are scattered about the city. When we left the fortress, it was only a few minutes walk to the old Hanseatic Assembly Rooms, beautiful buildings behind the historic wharf buildings. Along the way, my guide wanted to show me a residential neighborhood, and we paused at Kroken Street, a charming, cobbled pedestrian lane lined with clapboard houses and large old trees. We stood there for a few minutes, me wanting to learn more about the area, before crossing the street to the Schøtstuene, the Hanseatic Assembly Rooms where hot meals were served in the winter. Due to the constant danger of fire, they were kept separate from the historic wharf structures. Leaving the assembly rooms, we walked back through the alleyways of the old wharf buildings out onto the street along the harbor where we turned left in the direction of the little town square at the end of the harbor. We continued on up Kong Oscars Gate heading towards Bergen Cathedral, wandering down little side streets along the way. They all seemed to come from another era, cobbled lanes lined with shops and restaurants with colorful signs poking out above their doorways. When we reached the church, I understood why my guide wanted me to see it. Built in 1250, it is a simple, long-church design with a beautiful interior including a series of portraits in the entrance way. What made it unique, however, was the cannonball still stuck in the exterior wall above the entrance where it landed in 1665. I later walked over to the nearby Fløibanen funicular, which took me to the top of Fløyen, 1050 feet above sea level. I was rewarded with a beautiful view of the city and its fjord, as were the many Norwegians having lunch in the restaurant up there. 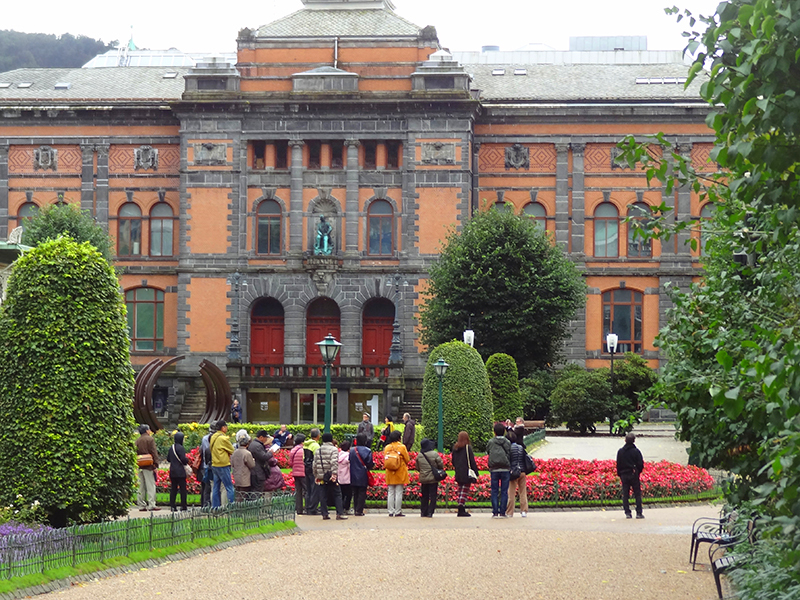 In addition to the Hanseatic, put on your list of things to do in Bergen to see a few museums. There are a clutch of galleries that face Lake Lille Lungegårdsvann, about a 15-minute walk away. Called Kode they are numbered one through four, something tour guides like because it makes it easier to explain them to tourists. The galleries house international art treasures ranging from classical to contemporary. I went into Kode 3, the Rasmus Meyers Collection, and found it very interesting, not so much because of my knowledge of art but because of the intimate way the museum is laid out. 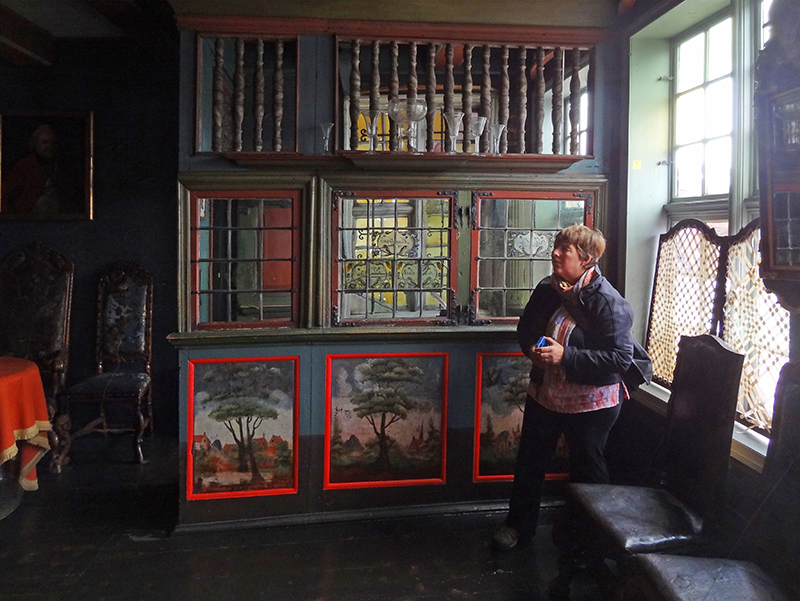 In some of its rooms, I felt I was viewing an art collection in someone’s private home. The converted mansion also contains works by renowned Norwegian painter Edvard Munch. (Another renowned Norwegian, Edvard Grieg, the composer of Peer Gynt and other masterpieces, is honored at the Edvard Grieg Museum about a half-hour south of the city). Because of its location on Norway’s southwestern coast in the midst of mountains and fjords, Bergen is an excellent place to set off fjord tours. The most popular fjord tours From Bergen, Norway are the “Norway in a Nutshell” tours that takes you on a cruise on the Nærøyfjord followed by a ride on the world-famous Flåm Railway. You depart from the railway station in Bergen, travel across the highest altitude railway in Northern Europe, and then connect with a bus that brings you to the ferry that sails up the fjord to Flam, a small village at the lower end of the Flam Railway. You then take the train on an incredible 13-mile ride up the mountains through some of the wildest and most magnificent mountain scenery Norway. At the end you connect with the train back to Bergen or, as I did, the express to Oslo. It sounds complicated but it isn’t, and it runs like clockwork. 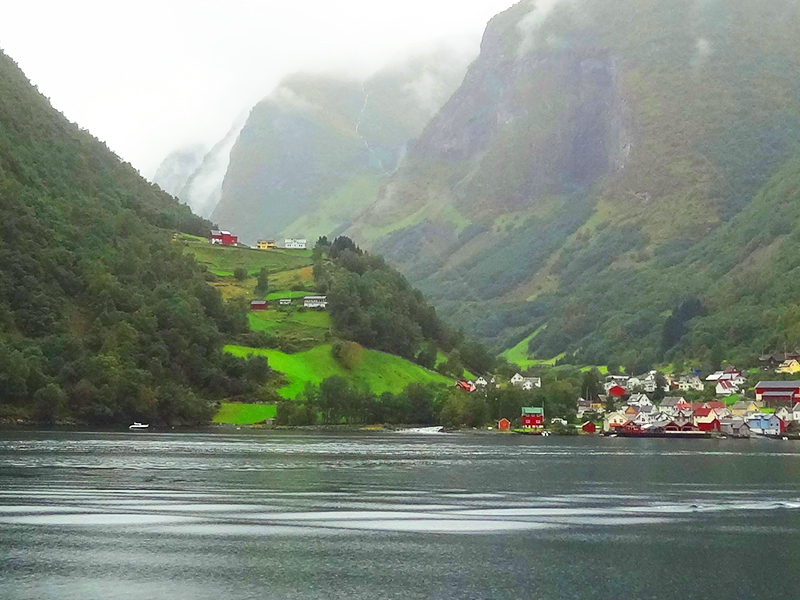 If you take only one fjord tour from Bergen, this should be it. The trip takes about 10 hours; cost is approximately $212 and is well worth it. The tour runs all year long. There is also a three-hour tour to the Osterfjorden via catamaran. It departs from the Zachariasbryggen quay at the Fish Market. The tour operates only September – December; cost is approximately $73 per adult. 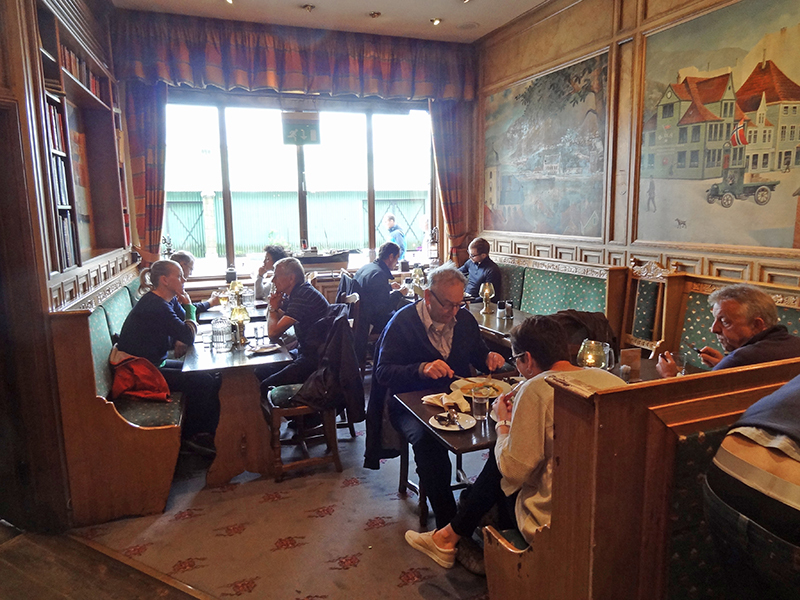 There are hundreds of restaurants in Bergen ranging from relatively reasonable to expensive. Among the latter is the 400-year old Altona wine bar and restaurant in the Augustine Hotel, my lodging while in Bergen, Norway. It has more than 1,000 different wines, and since it has no wine list, the staff does its best to match you with the one you’ll enjoy. I dined there my first night in Bergen, and both the dinner and wines by the glass were excellent. Another one of the excellent and comfortable restaurants in Bergen is Bryggeloftet & Stuene (Bryggen 11, Bergen, near the harbor), which serves traditional Norwegian cuisine, including fish and meats. It’s quite moderately priced with delicious meals. It’s location is good; try to get a seat by a window. Lower down the price scale among restaurants in Bergen is Söstrene Hagelin, (Strandgaten 3, 5013 Bergen) a popular little café/restaurant known for it fish, fast food and soups. Its sign touts it’s been serving “traditional Norwegian fast food since 1929.” A fish burger here is 75 kroner, about $10. 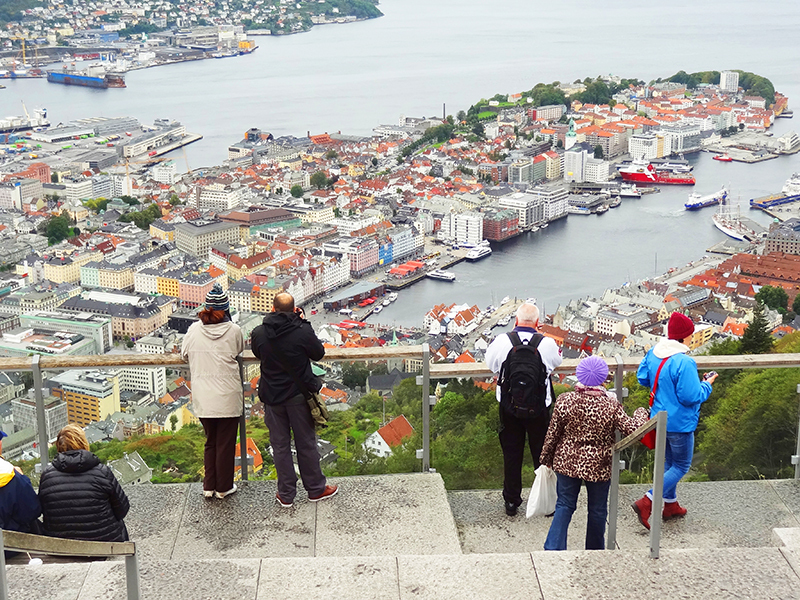 There is also a restaurant at the top of the funicular near the Hanseatic Wharf, which offers a lofty view of the city with prices to match. 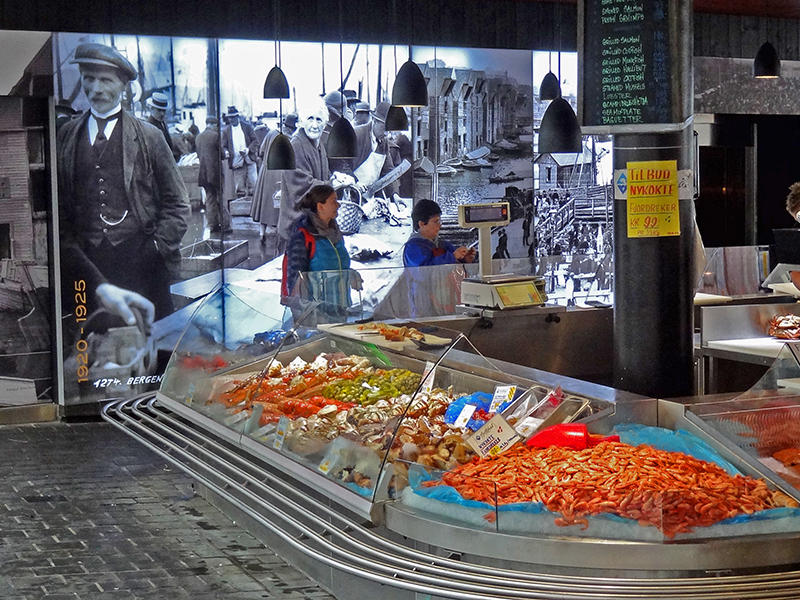 When you’re planning what to do in Bergen, Norway, make sure you include the Fish Market. Set in the heart of the city on the harbor, it’s a lively place where you’ll find not only fish but also fruit, vegetables, and flowers for sale. It’s also probably one of the few places outside a museum where you’ll find a polar bear, albeit stuffed, standing at its full height. It’s also a good place to grab a bite to eat whether you want fish or just a sandwich. Walking around the market, past countless lobsters, Atlantic salmon and every other imaginable denizen of the North Sea, I saw a sign for “Hvalkjøtt” with chunks of dark smoked meat beneath it. Knowing that whaling is still practiced by Norway, I asked the woman behind the counter if was whale. She told me yes, and when I asked what it tasted like she told me very much like beef. She then cut a tiny sliver off and handed it to me. It did taste much like salty beef with a slightly fishy taste and was, as is often said about many things, an acquired taste. Just the same, I think I’ll stick with steak. I’ve really enjoyed your articles on Helsinki, Oslo & Bergen. We were there about 3 years ago & you made it a great revisit. Thanks heaps.